Beautifully engraved RARE certificate from the Western Automatic Photo-Type Company issued in 1891. This historic document was printed by the Chicago Bank Note Co. and has an ornate border around it with a vignette of a man holding his hat in had sitting in front of a coin operated photo machine. This item is hand signed by the Company's President ( J. B. Arnold ) and Secretary ( Joseph Lanthrop )and is over 113 years old. This is the first time we have seen this certificate and have had it for sale. In 1889, Mathew Stiffens filed a patent for an automatic photography machine. Also in 1889, a similar machine was set up at the Exposition Universelle in Paris producing tintypes as souvenirs. These machines had many challanges such as coin jams and high maintenace requirements. 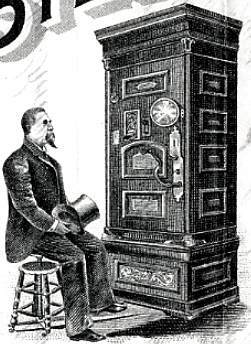 Nevertheless, this was the beginning of the coin operated photobooth that is still around today.